I've been getting back into online poker over the last week. 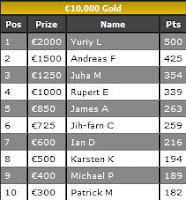 I had my eye on the recent Poker Heaven SNG promotion, racking up as many points as possible by cashing in €20+2 10-man SNGs. I came 2nd in a similar promotion last year. It became apparent that there were two sick monkies going to come first and second who didn't think it was necessary to eat/sleep/wash s o I kind of gave up with it. Also, having to contend with the dodgy Boss Media software was killing me, and I was running so below EV it was unfunny. I managed to hang onto fifth, despite quitting 4 days into the 7 day promotion. With the prize money and rakeback, I made a decent bit of dosh doing it, so I'm not going to complain too much. I thought after a few days of using such bog-standard software, I might as well have another crack at playing the 45 and 90 mans on Full Tilt rather than just jump straight back to PokerStars. My decision to crank up to 16 tables straight away was a little silly, as it turns out stacking tables on Full Tilt is just not at all smooth. I managed to run like death with 1 cash in 21 games, with the software and also the length of the games (up to 2 hours to finish as opposed to about 1 hour for PokerStars games) and I was just rueing my decision to bother with Full Tilt and couldn't wait to get back to PokerStars. So I have played a couple of sessions on there in the last couple of days, and I have come to re-appreciate how great the software really is. It's like when your missus goes away for a few days, and suddenly you have to do your own cooking and generally look after yourself and the house. When she comes back, you realise just how much she does and how much you need her. 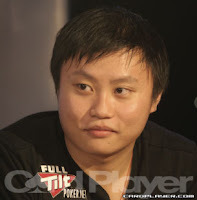 I'm happy to call PokerStars my home, and I have no reason, nor desire, to stray from there for the time being. I ran sickly good in the two sessions I've had so far, which has helped me get over my reluctance to go back to the 20-tabling grind after such a long absence from the tables. I was kinda intending to set myself some kind of target for the end of October, but I'm not sure what's realistic. For now I'll just keep tabs on how many games I've played, and hopefully I can get the volume up as I've been eeking my way in steadily. I've been watching a fair amount of poker on TV, with the Poker Million and Late Night Poker airing right now, but it's a shame so much of what gets aired is in the crapshooty 'Shoot-out' format. The European Cash Game 2 should be a nice break away from this, which is airing soon. The first series was well worth watching, with Eric Liu and Albert Iversen playing awesome, so it will be interesting how the new series goes down. At time of writing the WSOP-E Main Event is getting pretty exciting with play down to 4 handed, with both Hitsquader Praz Bansi and poker legend Daniel Negreanu still fighting it out for the bracelet. I'll be following the live updates as this one draws to a close! 0 Comment to "Around the block, but inevitably back 'home'..."